Like new beautiful home that shows Pride of Ownership as soon as you walk thru the beautiful front door!! Walk into the Living Room with Burl Hardwood floors that leads into the spacious eat in kitchen with tiled floor. First floor Laundry and a Large Master Bedroom and private master bath. The second floor has 2 bedrooms with a guest bathroom that has never been used!!! The full finished walkout basement has room for entertaining friends with wet bar and space to spread out. A tiled workout room or office, storage and another bathroom with a tub that has never been used!!! Brand new Puron AC, beautiful flooring, deck and patio in a home that is in absolute move in condition!! Sellers offering a one year 2-10 home warranty for the new owners peace of mind. Direction: Dixie to Flowervale, to Deering to Right on Leemont to left on Vevia Pl. to left on Pond Creek Dr. to right on Pond Creek Ct.
5502 Pond Creek Ct, Louisville KY 40272 is a Home, with 3 bedrooms which is recently sold, it has 2,283 sqft, 0 sized lot, and 2 Car Garage,Entry Front parking. 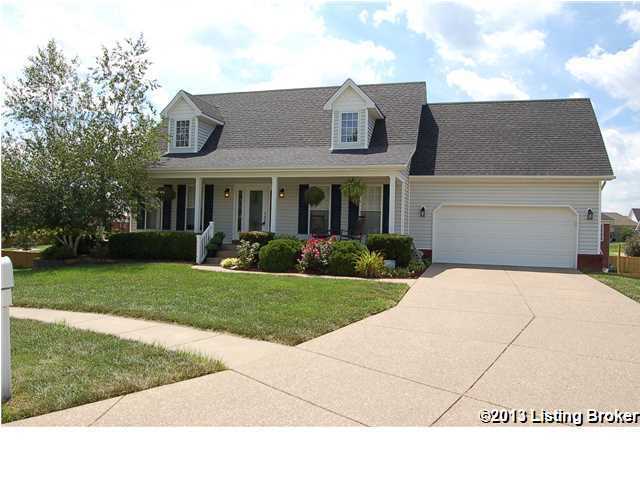 A comparable Home, has 4 bedrooms and 3.5 baths, it was built in and is located at 5602 Pleasure Ct Louisville KY 40272 and for sale by its owner at $ 249,900. This home is located in the city of Louisville , in zip code 40272, this Jefferson County Home, it is in the PLEASANT VIEW Subdivision, and Pleasant View are nearby neighborhoods.